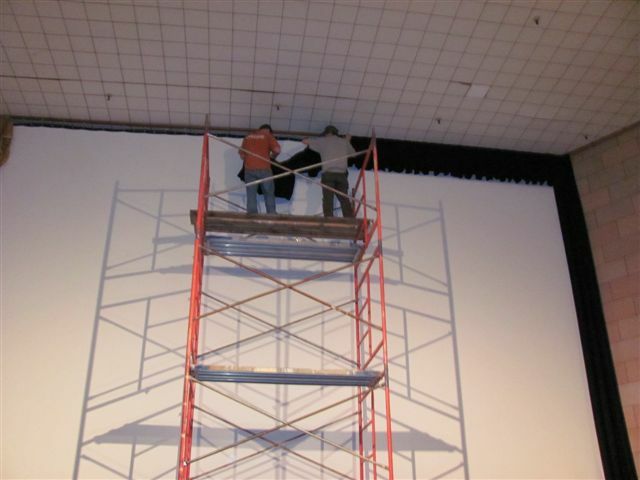 OAK GROVE — After operating almost two years with a bare screen in the front of the auditorium, The Historic Fiske Theatre got a much-needed facelift Monday, as her technicians installed new front end masking to the screen. With material donated by Superior Surgical in Eudora, Ark. movie goers no longer have to see the springs holding up the screen or blank screen during cinemascope movies, it is now all covered with black curtains, and with the black contrasting with the screen, the picture looks even brighter. The Fiske Theatre is operated by the West Carroll Chamber Fiske Theatre Board with all proceeds from theatre operation going toward theatre improvements and future entertainment for the citizens of Northeast Louisiana. This entry was posted in Uncategorized and tagged Fiske Theatre, Historic Fiske Theatre, LA, Movie Theatre, Oak Grove. Bookmark the permalink.